(Bloomberg) -- South Africa’s rand led emerging-market currency declines, extending a slump to a six-month low as investors bet there’s little chance the nation’s central bank will follow developing-nation peers in raising interest rates. The currency weakened as much as 2.4 percent before paring the decline to trade 1.4 percent weaker at 13.1617 per dollar as of 11:42 a.m. in Johannesburg, leading declines against the dollar. Yields on benchmark government bonds due 2026 soared 17 basis points to 8.97 percent, briefly spiking above 9 percent for the first time since December. As one of the most-liquid emerging-market currencies, the rand is bearing the brunt of a selloff sparked by rising U.S. rates, with the Federal Reserve expected to hike again next week. Turkey joined Indonesia and India in raising rates this week as their currencies sagged. South Africa’s central bank’s policy is to let the currency float freely, and it didn’t take action during bouts of currency weakness in the past two decades. The worst quarterly economic contraction in nine years suggests it won’t tighten anytime soon, according to Brown Brothers Harriman & Co. The rand reached its worst level since Dec. 15, days before Cyril Ramaphosa won the leadership of the African National Congress, putting him on course for the presidency. The currency’s decline worsened after the drop in Brazil’s real damped sentiment toward risky assets, driving losses on a gauge that tracks emerging-market currencies to the most in more than a week. The GDP report this week cast a pall over Ramaphosa’s promise to boost growth. 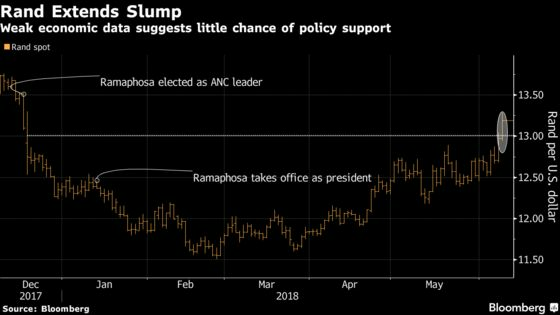 His rise to power since December initially boosted sentiment and the rand following Zuma’s scandal-ridden tenure, but confidence indexes have now returned to where they were late last year as businesses seek lasting change. 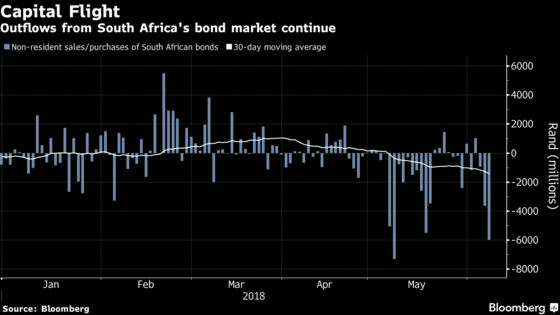 The rand’s plunge exacerbated the worst bond selloff on record by foreign investors, who dumped a net 6 billion rand ($455 million) of government debt on Thursday, according to the Johannesburg Stock Exchange. Average daily outflows in the past month rose to 1.4 billion rand, the most on record, according to data compiled by Bloomberg. After standing pat on the main policy rates last month, the central bank hinted that further loosening was off the table as inflation pressures build. Money markets are pricing in only 12 basis points of tightening over the next 12 months. “It is clear that the economy is in a fragile state and it may take some time before we see any evidence of a Ramaphosa effect,” said Natalie Rivett, a senior emerging-markets analyst at Informa Global Markets in London.